[prMac.com] Alameda, California - Karelia Software today announced the release of version 1.5 of Sandvox(R), a major update to its award-winning website creation software for Mac OS X. * new Code Injection points that give Pro Edition users greater power to adjust design and content. Sandvox features drag-and-drop website assembly, live editing without a preview mode, fifty stylish and flexible designs, eleven page types, and nineteen different pagelets. It's the easy, elegant website creation tool for people who want to spend time developing their lives, not their websites. Sandvox 1.5 is available for download and purchase from Karelia's website. in both Regular and Pro editions. Single-user licenses are $49.00 USD and $79.00 USD, respectively. Household licenses (allowing multiple users in one household) and site licenses are also available. More than ever, individuals, businesses, organizations, and schools are seeking cost-effective ways to share their news with the world, and Karelia is pleased offer this exceptional upgrade free to existing Sandvox users. Taking WYSIWYG to a new level, Sandvox provides Mac users with out-of-the-box power for quickly building attractive, effective websites without the need for additional purchases. Sandvox 1.5, a Universal Binary for PowerPC and Intel architectures, requires Mac OS X "Tiger" version 10.4.11 or above. Sandvox is available in English, French, Danish, German, and both Simplified and Traditional Chinese. More information about Sandvox is available at Karelia's website (created with Sandvox, of course). Members of the press and established bloggers are welcome to an evaluation license for Sandvox Pro. 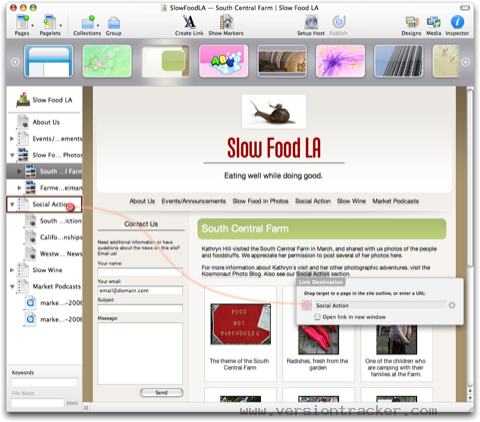 Karelia Software is the California-based company that originally brought you Watson, the ground-breaking Macintosh Web utility, winner of the MacWorld "Eddy" and the Apple Design Award for "Most Innovative Application." Karelia is headed by Dan Wood and Terrence Talbot. We joined forces to create Sandvox when we realized that even for the technically inclined, it was just too painful to get words and pictures on the Web. Copyright 2008 Karelia Software. All Rights Reserved. Sandvox is a trademark of Karelia Software. All other trademarks are the property of their respective owners.